Back by popular demand. You have another chance to take this class. It filled up the first time, so we are happy to say, Lisa is coming back! 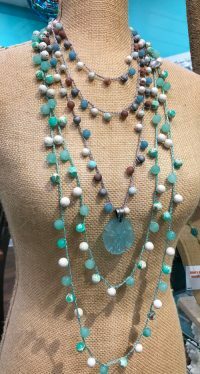 We are thrilled to have our guest teacher, Lisa Geer, to teach you how to create this simple Long and Versatile Crochet Necklace. If you have ever wondered how to crochet with beads this is the class for you. It is truly a stunning look. You will also receive a copy of the instructions with your class fee. Lisa is a Environmental Biology teacher at a one of our local schools. She has also been trained as a Goldsmith by a Master Jeweler. Her love of the outdoors inspires many of her creations. Join us in class and welcome her.